President Donald Trump, after visiting victims of a mass shooting in Las Vegas, said Wednesday that there was still no known motive for the attack but that investigators were "looking very hard" for answers. Trump, speaking alongside first lady Melania Trump, praised emergency and medical personnel who responded to the massacre, in which at least 58 people were killed and more than 500 were wounded. 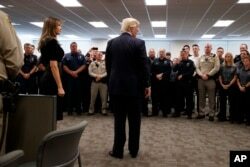 During prepared remarks, in front of police officers and Nevada politicians on a stage with the president at local police headquarters, Trump said, "We cannot be defined by the evil that threatens us," noting that "Americans defied death and hatred with love and with courage" in selflessly coming to the aid of others at peril to their own lives during the attack. The shooting happened Sunday night on the Las Vegas Strip, a popular American tourism destination. 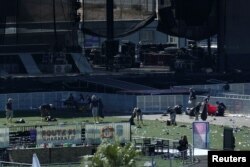 Police said Stephen Paddock, 64, from his 32nd-floor room at the Mandalay Bay Resort and Casino, fired on a crowd of 22,000 people attending a country music festival. Authorities said Paddock fatally shot himself as police moved in. 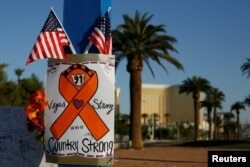 A sign is pictured at a makeshift memorial in the middle of Las Vegas Boulevard following the mass shooting in Las Vegas, Nevada, Oct. 4, 2017. "He's a sick, demented man," Trump said of the gunman during the meeting with first responders at the command center of the Las Vegas Metropolitan Police Department. The shooting has reignited a decades-old debate about guns in America. The president, when asked at the hospital about gun control, replied, "We're not going to talk about that today." 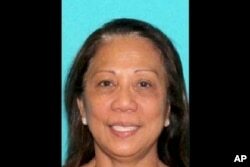 Trump landed in Las Vegas as FBI agents interviewed Paddock's girlfriend, Marilou Danley, for any clues as to what drove him to commit the mass shooting. This undated photo provided by the Las Vegas Metropolitan Police Department shows Marilou Danley. Danley, 62, returned to the United States from the Philippines on Oct. 3, 2017, and was met at Los Angeles International Airport by FBI agents, according to law enforcement officials. Danley apparently was in the Philippines at the time of the attack and took a flight back to the United States late Tuesday. She reportedly has told authorities she had no involvement with the planning of the shooting, but LVMPD Sheriff Joe Lombardo said Danley was a person of interest in the criminal investigation of the attack. U.S. security officials also said investigators were examining a $100,000 wire transfer that Paddock made to an account in the Philippines in the days before the shooting. An FBI Evidence Response Team investigates the crime scene in front of the stage area following the mass shooting in Las Vegas, Nevada, Oct. 4, 2017. 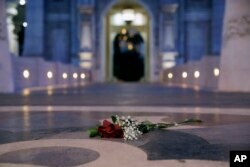 Authorities said the shooting was clearly premeditated. "The fact that he had the type of weaponry and the amount of weaponry in that room, it was pre-planned extensively and I'm pretty sure he evaluated everything he did in his actions, which is troublesome," Lombardo told reporters Tuesday. Investigators found 23 guns inside Paddock's hotel room and 12 "bump stock" devices that can enable a rifle to fire continuously. The gunman also set up multiple cameras looking into the hallway outside the room, apparently to monitor the police response.